Today was the last Day of NASA’s Space Apps Hackaton. The largest in the world with 9000 participants. We finished making a prototype of our boardgame including 3D-printed LunarBots. Jens took a 20 minute course in Maya and learned how to make a basic 3D-models. And I learned how to make a Stop Motion presentation movie with 144 frames using the simple app iMotion HD. See our final presentation on Bambuser. What I learned from the day is that we do this for our children. Let’s all think of and be like our children. With this being a space weekend we of course had to listen to some space music. And there is only one space music band for me: S.P.O.C.K. My favorite to songs is Dark Side of the Force and Wolf in the Fold. Bu the song we feature here is the very striking All the Children Shall Lead. Now is the time to invest in our children like never before. They must think us mad about the state we have left their Homeworld in. Change is happening all over the world. But in many places it is still on the wrong path. A path leading right of the edge of cliff. Are you on that path? If so you can help craft a new path for us and our children and their children’s children. Life is about the journey and what we leave behind. What path do we chose to travel on? If we teach our kids at a young age that don’t have to accept everything as it is happening to them. We can teach the to be curious about their own future. That they can be creative and design it them self. And spend their time crafting their own path. We take our lifestyle for granted and think of it as the most natural thing in the world. That’s why we must study history. So that we can learn how different it was in the past. In this way we can see that the our future can be very different too in kind. 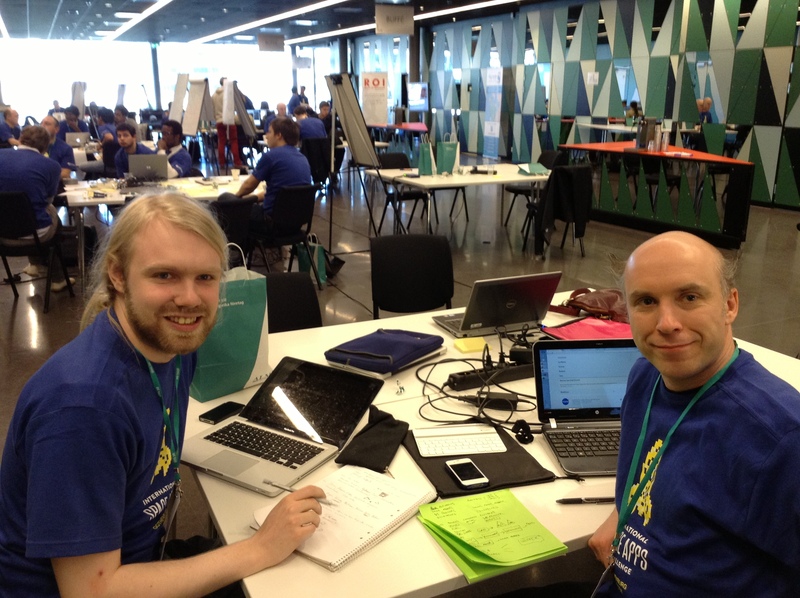 Today we started the NASA’s Space Apps Challenge. We are 8500 hackers around the Earth on the worlds largest Hackaton. First we had a Astronaut on ISS give us a welcome presentation. Then we sent out to face the challenges. The Swedish Astronaut Christer Fuglesang will join us on Sunday as one of the judges. Me myself had no team so I teamed up with Jens Nockert to take on one of the 50 Challenges that NASA have issued. We took on Bootstrapping of the Space Industry (#MoonVille). Check out the Google Hangout below for more information about the challenge. We are both gamers so we decided to make this game as a Boardgame called LunarBots. It’s about launching a self sustaining mining operation to the moon. We think of it as a learning and inspiration game for school kids to be used in school. To get the interested in space exploration and the space industry. To start them think about building a sustainable future here on earth where they can be an active part. The game is also a logistics puzzle with some co-operation. We had tour of Lindholmen Science Park where the challenge is being held here in Gothenburg, Sweden. We stopped by the Interaction Institute where they have a 3D-printer that we will be using to print our LunarBots in the game. Follow it on Twitter: #LunarBots. The project is of course a open source project so that anyone can download the game and craft a own copy. They can also help improve, develop and play-test the game. As a game of this type requires allot of balancing and play-testing before it is done. We also had a very interesting presentation on the work of the Interaction Institute by Peter Ljungstrand. He talked about all crazy real life experiments they are doing with technology and science. I also found out that my Boardgaming friend Staffan works there. The coming weekend I will be participating in NASA’s Space App Challenge. Where people all over the World will be solving some of the over 50 challenges issued. In a great collaborative effort to make Earth a better place to live together today and tomorrow. Here in Sweden it will take place in Gothenburg. We start out on Friday with a Get together and Afterwork. 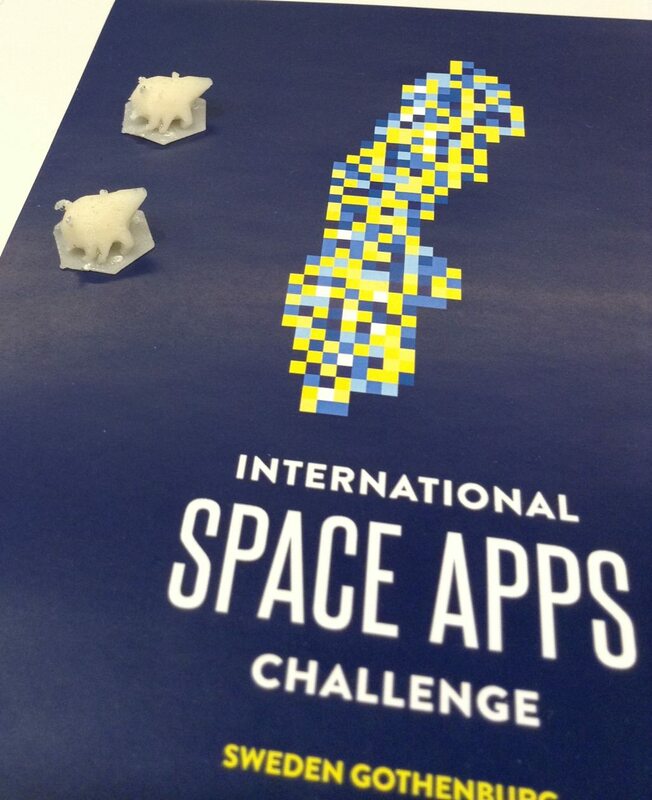 Do follow us on Swedish Twitter: #SpaceAppsSWE or on international: #SapceApps . For each year that we grow into the network society the world keeps getting smaller. I think we will get some really fantastic emerging effects from events like these. Back in the 60ties it was Star Trek that inspired many scientists and engineers. Where does our main inspiration come from today?